I've been told that the scales used in miniature gaming (25mm, 28mm, etc.) are a measure of the distance from base to the mini's eyes. Don't know how precise this is, but there does seem to be a fairly well established difference between them. 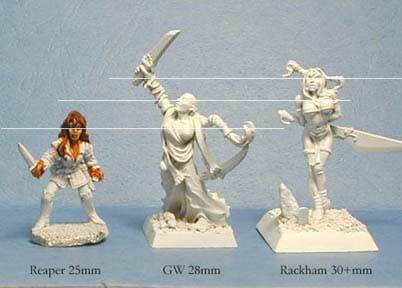 Many miniature sculpted before the 1990s, as well as a few of those produced today, are in true 25mm scale. 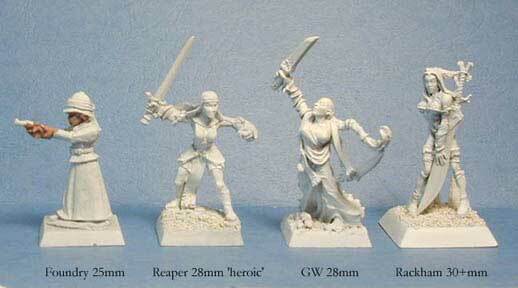 Some of Reaper's earlier pieces are 25mm, though the bulk of their newer pieces are 28mm or 'heroic' scale. Most Games Workshop, Ral Partha, and others are also 28mm scale. Rackham's Confrontation line is sculpted in 30-32mm scale, a size toward which many other manufacturers seem to be moving with their newer pieces. Different makers can often be mixed for gaming purposes by changing the basing on the figures. The Foundry and Reaper pieces below have stacked on regular 20mm square bases to lessen the height difference.